As you would expect from two artists who have considerable media experience, Eric Brace and Peter Cooper have once again demonstrated that uncanny knack of delivering a product straight into the approval arms of those music critics seeking a little sophistication. 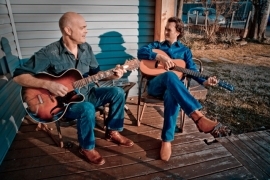 The two stalwarts of the East Nashville alt-country scene have utilised their own talents and engaged with some esteemed contributors to record an album brimful of articulate storytelling and sublime musicianship. As well as creating an intelligently designed listening experience, the duo has skilfully packaged a product that subtly adds value thus ensuring an effective engagement with their target audience. 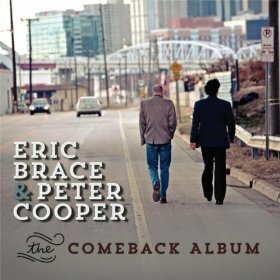 THE COMEBACK ALBUM is a tongue in cheek title as, although it’s only the third album since Eric Brace and Peter Cooper decided to formalise their collaboration as a recording act in 2004, the pair are also extremely active in other projects. Peter Cooper regularly crops up in the UK in his role as a highly regarded contributor to The Tennessean publication when the BBC requires an insight into the country music scene. Eric Brace is heavily involved in the Red Beet Record label which he founded and owns, and it also provided the mechanism to get this album made. Eric and Peter, as well as producing the record, are the lyrical architects behind nine of the twelve tracks with seven being co-writes. ‘Kissing Booth’ is solely credited to Eric due to it being an old track from his Last Train Home band who played the Maverick festival a couple of years ago. Peter teamed up with Baker Maultsby to pen a narrative based account of Boss Hall, Spartanburg, South Carolina titled ‘Thompson Street’, with it containing a neat accordion intro. The enlisting of the services of legendary pedal steel guitarist Lloyd Green has paid dividends with his trademark twang adorning the Karl Straub nostalgic number ‘Carolina’ as well as ‘Ponzi Scheme’ and the delightful ‘She Can’t Be Herself’. This last track portrays Eric and Peter as masters of the sad love song and is one of the album’s standout tracks alongside the beautiful country waltz like David Halley song ‘Rain Just Falls’. To enhance their version of the Tom T Hall song ‘Mad’, the pair persuaded three icons of Americana music to lend their talents. Bluegrass veteran Mac Wiseman supplied support vocals, guitar contribution came from no other but Duane Eddy, while the highly versatile Marty Stuart provided mandolin and extra vocals. This amazing performance epitomizes Eric’s and Peter’s approach to making music and the track has already been played on the Bob Harris Country show. Further evidence of the smart and eloquent output from the duo is found in the keyboard and pedal steel inspired ‘Johnson City’ which recalls Eric’s non-negotiable brief visit to the town’s jail. Both ‘Ancient History’ and ‘Nobody Knows’ carry on the intellectual theme with constant name checking weaving around the clever melodies. Any baseball context in the lyrics intensifies my listening and references to Babe Ruth and the Baltimore Orioles appear in these tracks. The diversity of the music content continues with some fiddle enhancing the track ‘Boxcars’ and a little clarinet adding a brass flavour to ‘Sailor’. It is this holistic approach to music making that continues to grow the reputation of Eric Brace and Peter Cooper who will be promoting the album in the UK for a few dates in June. So if you like your country music with a left field Americana tinge then THE COMEBACK ALBUM will suit you down to the ground.